I do a lot of research and often come across new trials while looking for one for Avascular Necrosis/Osteonecrosis I find ones that will help just about every other cause and I used to just pass them by. No I want to post them so it may be able to help someone. They usually only are good until they reach their quota. Oral medications are available but do not work for all patients. 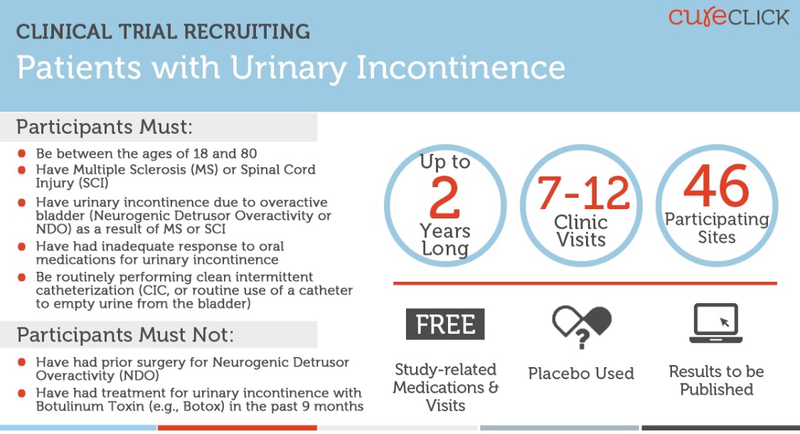 This trial will determine whether Dysport, an already approved drug for other conditions, can reduce urinary incontinence in patients with MS or SCI, for whom oral medications have not worked well.